Bharatiya Janata Party (BJP) President Amit Shah s boast at the national executive meeting about the party ruling for 50 years may have been in keeping with his usual aggressive bombastic style but it has been interpreted in two contradictory ways. One was to see it as a sign of arrogance and the other was to discern in the seeming extravagant claim a hint of whistling in the dark to keep up the party morale. Both the surmises have an element of plausibility. If the assertion underlines hauteur the reason undoubtedly is the BJP s belief that it faces no serious challenge at the moment. Notwithstanding the continuing unemployment agrarian distress high fuel prices falling rupee stagnant exports and the unease among the minorities and Dalits the opposition has not been able to get its act together. Because of this failure there are now doubts about how it will fare in the forthcoming assembly elections in Rajasthan Madhya Pradesh and Chhattisgarh since the BJP s main opponent in these states the Congress which was earlier expected to have an easy run has been unable to reach an understanding with the Bahujan Samaj Party (BSP) and is troubled by its familiar internal squabbling. Besides the question as to who will be the opposition s prime ministerial face is yet to be settled while there has been no clearcut articulation of an economic blueprint. The BJP on the other hand is pursuing a well-defined path. Even as "vikas" (development) remains its catchphrase it also cannily indulges in the ruses of what a dissident saffron intellectual and former BJP minister Arun Shourie has called a "one-trick pony". The "trick" according to him is to foment divisiveness which has been highlighted by the communal uncertainties posed by the National Register of Citizens which the Assam Chief Minister Sarbananda Sonowal wants to be extended from his state to the entire country so that the "ghuspetiyas" (infiltrators or illegal immigrants) can be summarily evicted. 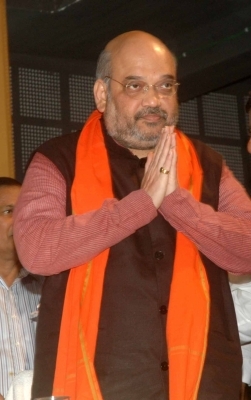 "Chun chun ke nikaloonga" as Amit Shah has thundered. The BJP s confidence apparently stems from the belief that while the promise of development will keep the youth and the middle class on its side -- as has been confirmed by the Delhi University Students Union election results where the BJP s student wing the Akhil Bharatiya Vidyarthi Parishad (ABVP) won three of the top four seats -- the party s nationalist plank targeting "ghuspetiyas" and the so-called urban Naxalites will keep the opposition off balance. How indifferent the BJP is towards such outrages or the disquiet expressed by the "secular" intelligentsia about its rule was evident from the seeming satisfaction which Amit Shah derived from the fact that the party keeps on winning despite the murder of Mohammed Akhlaq allegedly for eating beef or the "award wapsi" of the urban elite. It is not surprising that he believes that a combination of the promise of economic growth and a depiction of the opposition as unpatriotic will keep the "lion" safe from the "wild dogs" to quote the similes used by Rashtriya Swayamsevak Sangh (RSS) chief Mohan Bhagwat while addressing the World Hindu Congress in Chicago to describe the Sangh Parivar and its opponents. On its part the RSS has been engaged in broadening its appeal by calling the non-saffronites to its conclaves. It goes without saying that a possible mainstreaming of the avowedly pro-Hindu organisation will help the BJP to shake off to some extent the taint in the eyes of its opponents of its association with the RSS and thereby help in the fulfilment of the dream of ruling India for half a century. It cannot be gainsaid that at the moment much is going for the party. It has a Prime Minister whose popular appeal is testified by virtually all the opinion polls despite the government s palpable inadequacies. The party also has a chief whose micromanagement of the organization has turned it into a formidable election-winning outfit. In addition its publicity is boosted not only by its members in the government and the party but also by an army of trolls who lose no opportunity to pounce on the BJP s critics with venomous abuses. Not to be left behind in supporting the ruling dispensation are some nationalist television channels whose commitment to neutrality is conspicuous by its absence. With so much in the BJP s favour its 50-year project may not seem all that far-fetched -- except that the Indian voter remains famously inscrutable. Considering that the BJP secured no more than 31 per cent of the votes at the height of its popularity in 2014 it is obvious that a large percentage of the population do not think much of the party. It may be this inconvenient fact which made Amit Shah whistle in the dark.